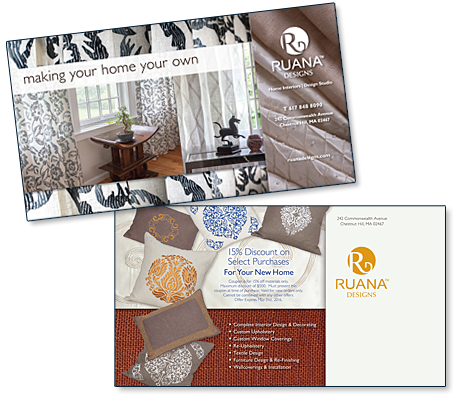 For Ruana Designs we created a direct mailpiece to make a special offer to their nearby potential clients. The mailpiece is also a coupon offering a special discount to their friends and neighbors. Ruana Designs is an exclusive interior design boutique which offers products and services to interior decorators and homeowners including textile design, custom window coverings and upholstery, wall coverings and installation, and furniture design and refinishing. You can shop their web site for curtains as well as silk, embroidered, and linen pillows.